After shutting down production of the S-300 missile defense system, Russia is moving to equip its new S-400 and S-500 systems with hypersonic missiles. A shortage of more advanced missiles, however, stands in the way of the Ministry of Defense’s plans. Russia is planning to open two major plants to produce much-needed advanced hypersonic missiles, but experts suggest that the country will be unable to counter a massive NATO attack for the next 10 years. The S-500 system has yet to be completed, while its S-400 predecessor can currently launch the older 48N6 and 9M96 missiles. The 77N6-N and 77N6-N1 models will be the first Russian missiles with inert warheads, which can destroy nuclear warheads by force of impact (i.e., by hitting them with precision at great speed). No explosives are needed: engineers’ estimates show that a collision at a speed of 7 kilometers (4.3 miles) per second would be sure to destroy just about any flying object. The new plants are vital for the development of an anti-missile shield above Russia, since new surface-to-air systems are already entering service unequipped with new missiles. For now, the “Triumph” (S-400) defense system is complete with missiles that have been left over from the old S-300 systems. Their range is around 124 miles, whereas the S-400s are designed to intercept targets at a distance of about 250 miles. 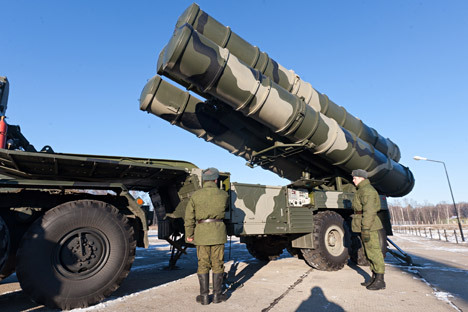 The absence of more advanced missiles stands in the way of fully equipping Russia’s Air Forces and Aerospace Defense Forces with the S-400 systems. Only seven divisions have been supplied with such systems since 2007, with another 49 waiting to receive them, according to official data. The missile shortage became even worse after production of the old S-300 systems was halted completely. Indeed, Moscow turned down a contract with Iran back in 2010, losing $800 million. Production was completely shut down after rolling out the last S-300 division intended for export, which is to be supplied to Algeria soon. One of the problems faced by the Russian defense industry is that it stopped accepting orders for the S-300s, but has not started to take orders for the S-400s, says Ashurbeili. The design of S-400 missiles has not been completed either. The system should be fully compatible with short-, medium- and long-range missiles. Presently, however, only short-range missiles intended for hitting targets within 95 miles have been designed without problems. Medium-range missiles (up to 155 miles) are still “raw,” and their design needs to be finalized. The long-range missiles are non-existent, even though such a missile would be a serious hindrance to potential enemy vehicles, including Airborne Warning and Control Systems (AWACS). Without these missiles, the S-400 cannot fulfill its purpose – engaging targets at a long range. As for the future S-500 system, it will be an S-400 with long-range missiles, according to Alexanderf Khramchikhin, deputy director of the Institute for Political and Military Analysis. “The S-500s will at best be created in 2020 – no earlier. At present, and for the next 10 years, the chances of countering a massive NATO attack are very low: it takes a long time to recharge the S-300s, so, in the best case, they will only repel the first wave of an assault, which would be 100 to 200 targets,” says Khramchikhin. Military expert Vladislav Shurygin agrees with Khramchikhin. “For now, the S-500 is an ephemeral dream, and no one knows if it will ever come true,” he said. Even though the S-300s need to be replaced, there is simply no replacement for them. This is why Almaz-Antey is faced with some very important tasks. “Handling them will determine the future not only of the anti-missile defense system, but also of the country as a whole,” says Shurygin. The company is still capable of manufacturing high-quality products, but it needs to modernize its technologies and refurbish its production facilities quickly. In other words, the production of modern aerospace defense weaponry is a comprehensive task which requires major technological innovations and modernization of existing production facilities.